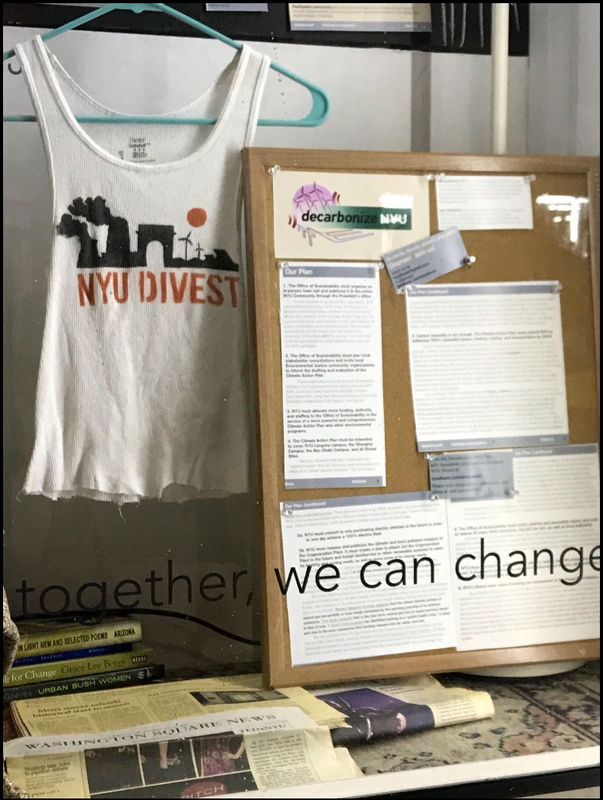 Decarbonize NYU is a subcampaign of NYU Divest working to align NYU’s climate mitigation initiatives with the imperatives of Climate and Environmental Justice, and to extend NYU’s ambition beyond emissions reductions towards the just transition to 100% renewable energy. Our Resolution for Decarbonization just passed NYU's Student Senators Council with near-unanimity, and is now awaiting presentation and passage at the full University Senate. The President of NYU and the Vice President of Sustainability are currently thinking about how to make NYU a green urban university in the long-term. NYU Does not currently have a climate action plan in effect. This offers us the opportunity as a university community to ensure NYU’s response to climate change reflects a just, ambitious, and science-based vision of climate mitigation. Our plan, our history, and the movement we form part of are on display at Kimmel Windows. We are proud to stand alongside our heroes GOLES, LESReady, and NYDIS in this space. Come visit the street-facing exhibition at the corner of Laguardia and West 3rd. EarthMatters is NYU's oldest student run environmental organization on campus. GCOMMS is a Governance Council made up of organizations on NYU's campus that are of minority and marginalized communities. “GCOMMS at NYU proudly and unreservedly endorses NYU Divest's "Decarbonize NYU" plan. Decarbonization is necessary for the continued survival of Earth and its occupants. Climate change is not a problem whose consequences will be borne only by future generations–it is severely harming communities RIGHT NOW, and its injury has been felt disproportionately by black and brown folks. The Urban Democracy Lab promotes critical, creative, just, and sustainable forms of urbanism primarily through novel forms of practice-based research. IEC is a group of community members working to end discrimination against formerly incarcerated college applicants. GSOC is the union for graduate employees at NYU and it advocates union democracy, mass participation, and social justice values. Animal Welfare Collective is a community of New York University students who care about animals and advocate for their rights.